Powerful Effective Relief. Contains caffeine to amplify the pain-relieving effect of paracetamol. Reduces Fever. Contains paracetamol and caffeine, always read the label. Panadol Extra Advance Tablets are formulated to provide effective pain relief and help to reduce fever. The tablets contain two active ingredients. Paracetamol is a pain reliever and caffeine acts to further amplify the pain-relieving effect of paracetamol. 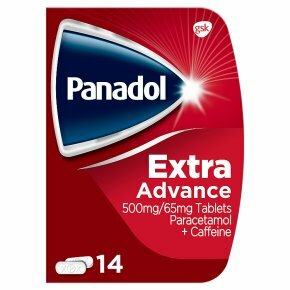 When you've got a headache, Panadol Extra Advance can deliver powerful, effective relief. And it's gentle on your stomach too. When to Use Panadol Extra Advance Panadol Extra Advance can relieve tough head pain including Migraines. Containing paracetamol, Panadol Extra Advance can also relieve common types of pain, including back pain, toothache, period pain and joint pain. How to Take Adults and children aged 12 years and over: Swallow 2 tablets every 4 hours as needed. Do not take more frequently than every 4 hours. Do not take more than 8 tablets in 24 hours. Do not give to children under 12 years. Avoid too much caffeine in drinks like coffee and tea. High caffeine intake can cause difficulty sleeping, shaking and an uncomfortable feeling in the chest. Please read through the information on the outside and inside of this pack before you start using this medicine. If you have any questions, or if there is anything you do not understand, ask your pharmacist.